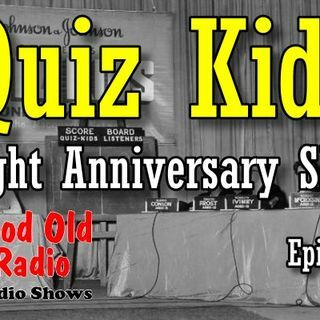 Today we feature The Quiz Kids: Eight Anniversary Show. July 6, 1949 to July 5, 1953, with Joe Kelly as quizmaster, and again from January 12 to September 27, 1956, with Clifton Fadiman as host. The premise of the original show involved Kelly asking questions sent in by listeners and researched by Eliza Hickok and Rachel Stevenson. his flash card. Yet he was remarkably kind and affable, and put even novice young contestants at ease immediately. as well as such qualities as poise, quickness, and sense of humor. One of the first Quiz Kids was seven-year-old nature expert Gerard Darrow. For the initial premiere panel he was joined by Mary Ann Anderson, Joan Bishop, Van Dyke Tiers and Charles Schwartz. top scorers each week joined by two others the following week; they were no longer eligible to participate once they reached the age of 16.